This looks absolutely gorgeous!!!! my mom would love this for christmas. 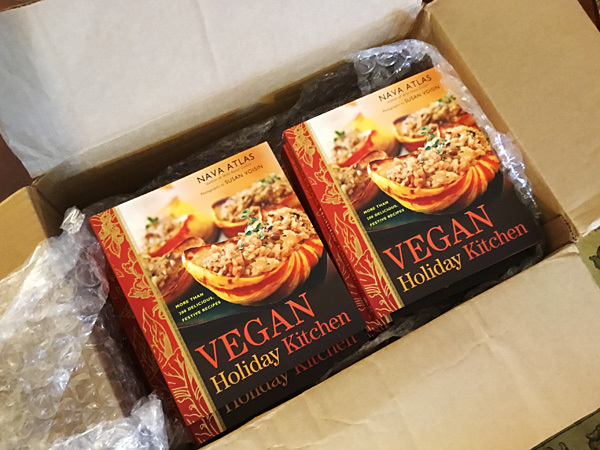 Just in time for the holidays and looks delicious! I will make with gluten free flour and see how it comes out. I subscribe to your newsletter and follow you on Facebook. This recipe looks amazing and I would so love to have this book. If I don’t win, I’m definitely ordering it! Thanks so much, Susan! Does this have to be refrigerated? Looks amazing! It’ll keep for a day, but any longer than that, I would refrigerate it. I’ve finally started learning that treats don’t have to be fatty, sugary indulgences outside my normal healthy living, that they can be a healthy part of life. Thank you for that! Looking forward to trying this beautiful cake! I would LOVE to win a copy of your cookbook! I can’t wait to make this cake. Thank you. I would love to win a copy of this cookbook. It is perfect for the holidays coming up and everyday use! Would this work with frozen cranberries? It should, but I haven’t tried it. Love your recipes Susan. Thank you so much for all you do! Wow! Love all the options and can’t waot to try this cake! Susan, been following you for years. My first and favorite was your “Dirty Little Secret” Soup. Thanks for all you do. I appreciate all your recipes and blog posts. It seems you were one of the first to cook this way, and paved the way for many more. 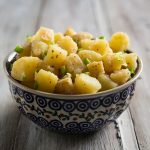 I’m gluten intolerant, so this recipe won’t work for me, but I love that the majority of your recipes still do work for me. Thanks! I live in Canada, so that disqualifies me, but if you ever lift the restriction, please consider me for one of your gifts! Another suggestion for a simple icing is an icing sugar glaze/drizzle, either with lemon or orange or plain. 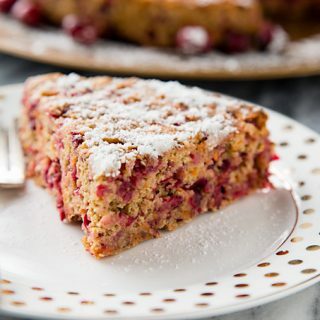 I recently asked a bakery if they used fresh cranberries in their cranberry-nut muffins, and they said they use craisins (dried cranberries) which made sense to me because I would think fresh cranberries would collapse and release their juices when baked in a cake? I also thought they’d be super sour! 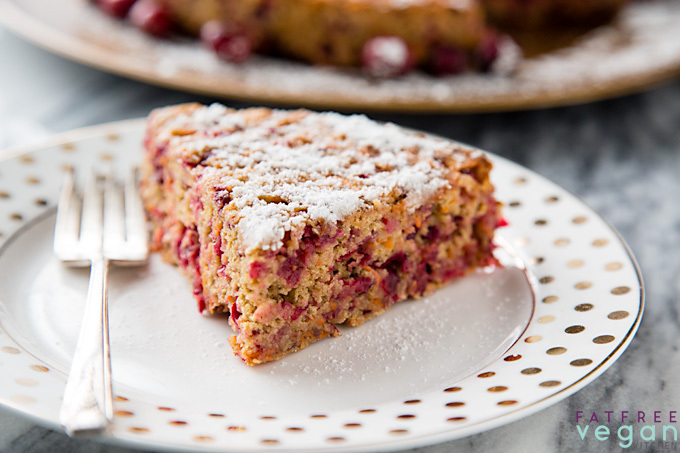 How do the fresh cranberries in the cake taste, and did they create liquid pockets? Coincidentally, (before getting your e-mail this afternoon), I shared a link to your Seitan Stuffed with Walnuts, Dried Cranberries, and Mushrooms on my FB page this morning along with a couple of my own tweaks. I made your loaf for “A Taste of Compassion” sponsored by Transition Framingham (MA) last weekend, and it was a huge HIT!! They planned the event a couple weeks ahead of Thanksgiving to give people cooking ideas that don’t involve turkey or other animal-based foods. The cranberries have a chance to release their juices after they’re chopped and mixed with sugar. They provide a good bit of the moisture in the recipe. I could see them being problematic if they were whole, but chopped up like this, they work great. They’re tangy but not tart. Beautiful cake! You’re recipes look incredible! Can’t wait to try the ribs! Love your blog and follow your recipes already! LOVE that I can count on you to help me with my food choices by supplying me with recipes I can count on. Love you’re recipes! Hope to win! Been a follower on your FB page Susan 🙂. Fingers crossed 🙏. Was just looking for a recipe to make something for my elderly neighbor and got your newsletter! 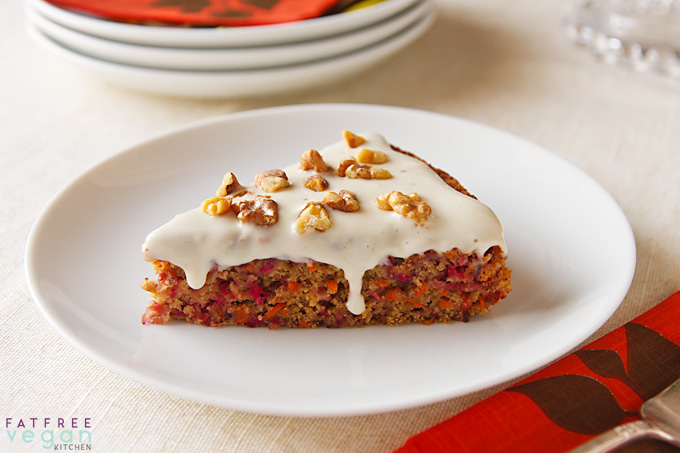 Perfect timing, this cranberry carrot cake will be perfect. I have subscribed to your newsletter and blog since we changed our eating lifestyle about 10 years ago and more recently started following on facebook. I would love to win a cookbook, thank you Susan for the opportunity and for all the great tips and recipes. You are my “go-to” site when I’m looking for something to make! Sorry, I can’t rate the recipe until I try it – but I’m sure it’s another 5*! This sounds like another winner of a recipe from Fat Free Vegan. I will try it this weekend! I already own a copy of this wonderful cookbook. Truly a must have for any vegan. The challah made with pureed squash instead of egg is worth the price of the book. In fact, I wore my first copy out and bought a second one. There are menus and recipes for Jewish as well as Secular and Christian holidays. If you don’t win one, treat yourself and buy a copy. I already am a subscriber, follow you on instagram and facebook. Please enter me in the giveaway. I’m so glad that you get to spend Thanksgiving with E. I can’t believe she’s been in college 3 years already. What a gorgeous cake! Happy Thanksgiving! I subscribe to your newsletter and look forward to the new recipes I receive. bI can’t wait to try this cake. Your recipes are always so beautiful and tasty. I have finally adopted a 100% vegan diet and feel better than I have felt in 30 years. Thanks for making it easy, Susan. Can’t wait to try this at my first vegan Thanksgiving! I already follow you on Facebook and Instagram and get your newsletter!! This cake looks amazing. I have all of the ingredients handy (except for a good pan to bake it in). It’s on my list for my family’s Christmas meal. Thanks!! Your recipes all looks amazing! 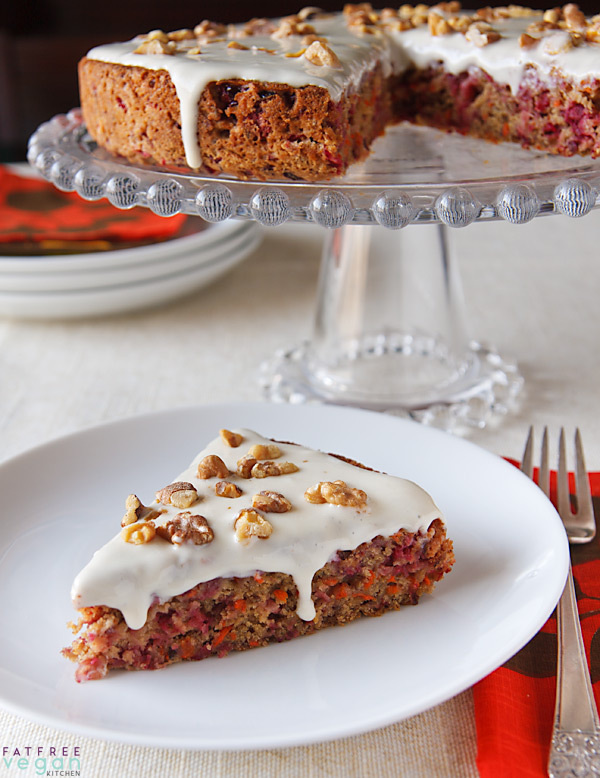 I love carrot cake and cranberries, so can’t wait to try this one. Thanks so much. I’d love to win that holiday book. 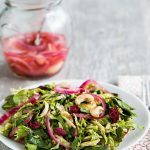 I’m a longtime subscriber, follower and happy user of your wonderful recipes! This looks delicious! Thanks for all your wonderful recipes and for the book giveaways! 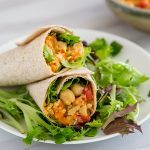 Your blog and website are my go-to places for FF vegan recipes and ideas. Thanks for all the info. and inspiration! I already subscribe to your newsletter and FB page. Love the cake. Need the book. That cake looks amazing and delicious, frosting or no! I already “liked” your Facebook page, so please enter me in the contest. Thanks. P.S. 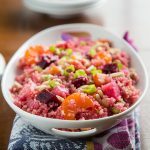 Your cranberry relish is the best ever and has become a personal tradition at my house! I subscribe to your newsletter. The cake looks wonderful. I already subscribe to the newsletter and follow on facebook. I can’t wait to try this. 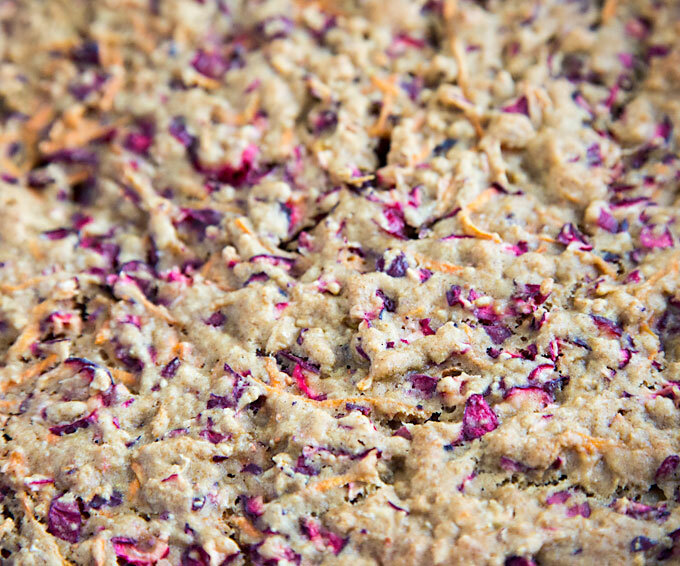 It has all the things I like in baked goods in one recipe!
. Lovely cake, and happy holidays! My grandsons except baked goods from me weekly. I’ve been trying no oil recipes lately. Can’t wait to try this recipe for my family this Thanksgiving. I would love to win a copy of this new cookbook and try the recipes on my omni family this holiday season. I am currently subscribed to your newsletter . I follow on Facebook @Dee Walker, Instagram and also receive your newsletter. This cake looks so appetizing — a beautiful addition to the holidays. Love your site and all of your amazing tecipes!